Welcome to our School Trips and Events page! This year’s International Women’s Day has been pretty special and overwhelming. The TeenGirlSummit held at PLS was a great way to celebrate the day itself with super inspiring and empowering women. Operating internationally, TeenGirlSummit has impacted 1000s of girls’ lives through the events they run worldwide. Our guests speakers were Lisa Goodchild (Digital Media Entrepreneur founder and CEO of Digiwoo); Natalie Stewart (seven time Grammy Award nominee, platinum selling international Neo Soul sensation and poet, the Floacist); Inspiring Vanessa (12 year old young author, public speaker YouTuber and model); Tendai Chagweda (DJ teacher, social media trainer, transformer coach); Natalie Rose ( TV producer); Sabrina Boanu MBE (Relationship Manager at Baclays Bank, Founder, MD at SkillsReform); Charlene Noel (Violence against women and girls programme and strategy manager Crime Reduction team service); Antonia Black (Senior Interior Designer Entrepreneur). 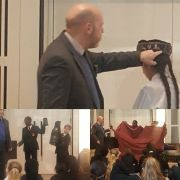 “It was the second time working with a school in Lewisham and the speakers were greeted with polite and engaged girls. The event was super organised and we got to spend the whole morning with the girls sharing our journeys from employees to entrepreneurs. I’ve worked with education establishments in Southwark, Essex, Lewisham and Croydon and, I must say, Prendergast Ladywell impressed me. In particular their passion and creativity for wellbeing”. We thank our guests for a truly inspiring event. On Wednesday 13 February Prendergast Ladywell school hosted a special Lads Assembly. The guest speaker was Marcus-Alexander Neil, a native of Lewisham who studied Master of Engineering (MEng), Chemical Engineering at University of Oxford and works as UK STEM Social Investment Lead. Mr Neil shared his passion for Engineering and STEM (Science, Technology, Engineering and Mathematics) and his career journey, including some of the challenges he faced as a young black man attending one of the world’s top universities, Oxford. In his interactive presentation Mr Neil spoke about the different types of engineering, namely: Aeronautical, Mechanical, Civil, Software, Motor, Biomedical, Battery, Rail and Space. He also discussed cleaner energy solutions, underprivileged crowded cities, under- developed urban cities developing mega-hubs and urban powerhouses. As a passionate advocate for social mobility Mr Neil encouraged our young men to aim high. We look forward to working with Mr Neil through Shell’s Tomorrow's Engineers Energy Quest and The Bright Ideas Challenge programmes. Read more about them here https://www.tomorrowsengineers.org.uk/energy-quest/ and https://www.shell.co.uk/energy-and-innovation/make-the-future/schools/bright-ideas-challenge.html#iframe=L2Zvcm1zL2JyaWdodF9pZGVhc19jaGFsbGVuZ2VfcmVnaXN0cmF0aW9uXzIwMTg. On Friday 23 November, 14 Year 11 students visited London South Bank University for an Experience Day in Engineering. The students were able to participate in different workshops and projects relating to their career ambitions: Computer Science, Informatics and Mechanical Engineering. The lecturers leading the tour gave very good feedback regarding the students and were very pleased with the amount of questions asked which gave them a clear view of a career in engineering. The experience day was a great success for the students. Year 11 students were given another great opportunity to experience life as a university student at the London Southbank University as part of Universities Experience Days; students who would like a career pathway in the Art and the Creative industry. Students were also given an insight to the world of work, informed about the different opportunities that come with being a part of the creative industry and what jobs could be available for them when they leave University. Prendergast Ladywell School hosted Simon Stevens CEO of the NHS. He spoke with great engagement to pupils in Year 9 10 and 11 from all three schools in the Federation. As well as celebrating the 70th birthday of the NHS he was inspiring and illuminating about careers and employment in the NHS, Europe’s largest employer. Students asked thoughtful and incisive questions. He left saying PLS was an impressive school, with a strong culture of learning and aspiration. Speakers for Schools have again provided a terrific event for us, and they were particularly impressed by the questions the pupils asked. Year 11 Art students had an excellent trip out to Shoreditch and the surrounding area to view a wide selection of Street Art. The Street Art tour allowed students to see works of art and graffiti writing by a range of artists and will form a strong addition to their Urban Portrait Project portfolios. The tour included work by the renowned street artist 'Dreph' who will also be attending PLS in the future to give a talk and to run a workshop. Students were fantastic and came away from the day with a range of new ideas to inspire their final responses for their project. Year 11 were given a great opportunity to experience life as a university student at the London South Bank University as part of universities experience days. Students wanting to take the career pathway into Law and Social Sciences experienced what it is to be a university student studying Law or Social Science. The students took part in various workshops surrounding Law and Social Science, Criminology, History, Politics, Law, International Relations and Events & Tourism. Students also took part in lectures and debates. On 13 September Ava (Y11) and Woody (Y10) from Prendergast Ladywell School took part in the student panel discussion that complemented the annual launch of the non-profit initiative Digital Schoolhouse, supported by the research report on Online Safety: A Pupil’s Perspective. Digital Schoolhouse’s annual panel discussion, which this year asked, “Can our tech industry do more to facilitate a safer online experience for the end-user?” was chaired by Keza MacDonald, Video Games Editor at The Guardian, and panellists included six students from the secondary schools in UK, Stuart Wright, Chief Technology Officer from SEGA Europe, John Constable, Headteacher at Langley Grammar School, Will Freeman, Video Games Journalist for Ask About Games, Gianni Zamo, Communications Officer for the VSC Ratings Board and Caroline Hurst, Director of Education, Childnet International. Ava and Woody were delighted to be able to express their opinions and compare their viewpoints with those of the professionals from the different fields in the tech industry. On Thursday 4 October Prendergast Ladywell hosted it’s first–ever Careers Expo. Students were invited to engage with a wide variety of potential employers with a view to gaining a real understanding of the opportunities and roles available within their organisation. Some of the employers’ present were the Army, London Fire Brigade, London Metropolitan Police, The Voice Newspaper, British Academy of Jewellers, London Hairdressing Apprenticeship Academy (LHAA), Leyf, Hill, 3aaa, Group M, Chequers, independent artist Jon Judace and Big Creative Education. 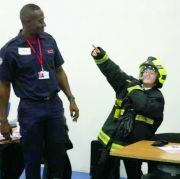 Students were engaged and inspired; they were especially drawn to the London Fire Brigade who brought a full “try me” kit, much to student’s delight, the Army and all the various careers within, Big Creative Education who offer exciting courses in media, photography and dance and Jon Judace whose African Culture, Cosmology and Mathematics themed artwork instantly appealed to the students. Presenters were happy to answer questions and discuss training and opportunities such as Apprenticeships, work experience and taster days, and also shared insights in to what it is like to work in their sector, most desirable employability skills and career progression. Early on the morning of Saturday 15 September, Ms Kolodziej and Miss Kazim set off from the start line of the Duke of Edinburgh Adventure, on a 50km hike over two days across the (surprisingly hilly) Cotswolds. Special mention has to go to Ms Kolodziej, who not only finished the route and was still able to walk but also completed the route in record time. A huge thanks also go to all those who donated, helping to raise over £400 for a fantastic charity! 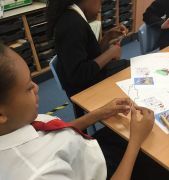 On Friday 13 July PLS hosted a whole day event for seven different Lewisham schools, approximately 100 students from Year 9 and 10 and the first of its kind. We linked a range of services together and partnered with the Young Mayors team, Safeguarding Children board and ATLAS. The day started with a motivational talk from Nathaniel Peat who is a Pilot, Martial artist and world class public speaker. He delivered a 45min talk which was inspirational, humorous and informative. The students were left buzzing with passion and excitement, which is nicely captured on film and through images. We had an amazing panel to end the day and Mr Hand, Headteacher, made a great speech thanking all involved in making the day a success. This took great team work, clear visions, passion to change and save lives and a Headteacher who is willing to support the outcome. All of the students were well behaved and are desperate for more events like this which is evidenced in their questionnaires. We hope to continue Teen Summit so that more students can benefit and be inspired to be great. The Teen Summit on 13 July 2018, the first of its kind in Lewisham, showed what can be achieved when students from different secondary schools in Lewisham are brought together. I would like to thank you for a wonderful and productive teen summit. It was a fruitful and amazing time for myself and my colleagues. Feedback from the practitioners who delivered the ‘Staying Safe Online’ and ‘Staying Safe in the Community’ workshops on behalf of the Board, commented on the many successes of the day – one of many being the sheer engagement from the students – as some of them highlighted that they enjoyed these workshops the most. I enjoyed participating in the event. The young people we engaged left me surprised with what they had to say through the poetry they wrote. Many of them were keen to stay in touch and perform at events. It gave me an immense feeling of gratitude to see how despite being in doubt of their poems, and poetry itself, they gave it their all in every performance. As each of them started to show more enthusiasm, it encouraged everyone to give their all, which they did. All of the speakers really benefited me with their immense knowledge and I also enjoyed the panel discussion. I would definitely attend another event like this. It has the power to make an impact on not only young people, but people of all ages. I’d love to be involved in speaking or performing if there ever is another one in the future. Thank you so much for the opportunity! It was such an amazing day, you and the rest of the team should be very proud. It was an honour to be a part of the day, the students were really great! Rocket Readers, our PLS reading scheme, celebrated its five year “wooden” anniversary in June. We decided that a theme of wood wouldn’t be in keeping with the glamour associated with this event, so “Reading Treasures” was launched. In the five years that Rocket Readers has been running hundreds of books have been read and the celebrations for this have become bigger and better every year. Our 2014 Rocket readers (pictured below) graduated from PLS this year, with high expectations of good GCSE results and more students than ever going on to study English at a higher level. In 2018 fifty students all read more than 10 books and attended our red carpet award evening. As the day of the event approached it became clear that a rather important football game would be played on that night, but this did not deter our avid readers. On one of the hottest days of the year, looking amazing in their best clothes with golden accessories, our winners enjoyed a lovely celebration. We were very lucky to have three amazing authors as our guest presenters. Ruth Eastham gave us an insight into how she writes using illustrations of Viking ships and gory archaeological findings as her inspiration. Gareth P Jones kept everyone laughing with his ukulele sing-a-long and ensured that no one would forget his novel “Death or Ice Cream” or indeed his name! Last, but never least, our own Miss Mussi, shared some anecdotes about her writing career and how it started because, as the youngest child, she never got the TV control. The poster designing competition was won by Emily Yau in Year 7. Her entry will be used as the poster to promote rocket readers in 2018–19. We look forward to many more celebrations in the future, as our new Year 7s, starting in September, embark on their own Rocket Reader journeys. Well done to all of this year’s winners and a big thank you to Miss Zensen, Miss Shaw and the English Department for making it all happen and to Miss Boucher for stepping in as official photographer at the last minute. 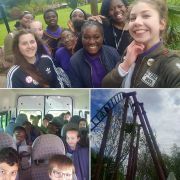 Students were happy to be rewarded for their hard work and efforts in school with a trip to Chessington World of Adventure. All had fun in the sun as they explored the animals, rides and other activities. Rewards trips are a great incentive for students at PLS and is a great way of encouraging and motivating students to do their best. Thank you to Year Leader Matthew King who took our Y10 Envision students to the Envision final… PLS were the winners! The competition included four other schools from Lewisham. Our students raised a grand total of £3,066 for their chosen charity. Well done to the students involved: John Akinboluwajo, Dillon Bishop-Owusu, Casey-James Eldridge, Giorgia Nair, Etwan Omar, Daniella Salmon, Jean Sangila, Diaz Spencer and Ben Vu. Miss Shaw (Librarian) and students with author Tamara MacFarlane at the Lewisham Book Awards 2018 held at Sydenham School. 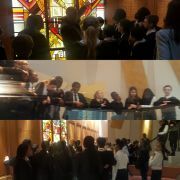 Year 8 students were privileged to attend the the palatial Royal Courts of Justice to take part in a mock case. There, selected students donned wigs and gowns for their roles, some played members of the Jury, whilst others played witnesses. 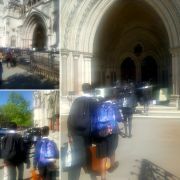 Students thoroughly enjoyed their experience, some are already exploring careers in Law. We were very fortunate to welcome Caroline Goyder in to school on Monday 30 April to talk to Year 10 about how to be an effective speaker. Caroline is a leading voice coach, having worked at the Central School of Speech and Drama, and with many clients from the business and entertainment world. The timing couldn’t have been more perfect for our Year 10 students, as they were due to complete their recorded spoken language assessments as part of their English Language GCSE course in the following few weeks. Caroline held everyone’s attention from the start, reminding us that knowledge must be delivered with passion and purpose in order to be effective. The session was very interactive with students developing confidence in their posture by taking on various super hero stances. Dealing with nerves was also covered, and students learned the acronym FOFBOC (feet on floor, bum on seat), to encourage them to feel steady and grounded when awaiting their turn. had thoroughly enjoyed the session, and was particularly impressed with our students’ drive and energy. on this panel. Students, staff and families engaged in interesting questioning and discussion about how their careers had developed and their tips for our students’ future success. We were pleased to see a wider range of families and students attending the evening and that the diversity of Urban Synergy role models allowed students to see new and inspirational careers. The evening was a great launch pad for the students as they develop their aspirations and ambitions through our continued Pastoral and PSHE programmes. We look forward to hosting this annual event again next year. PLS BBC School Reporters interviewed John Boyega about his new film, Pacific Rim Uprising. Their interview was featured on BBC London News on 19 March 2018; well done to Hari and Azra for this amazing job! 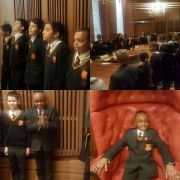 Another brilliant experience for our Year 7s to visit Leathersellers' Livery Hall and learn about City Guilds and the versatility of leather! 14 Year 8 PLS Young City Poets went on a school trip to Tower Bridge to participate on a mini tour of the Bridge. They learnt how the Bridge works and how it has changed over the years. 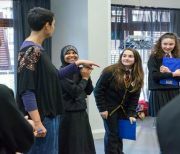 On 5 March, the students had a workshop with the poet Laila Sumpton where they had to write two monologue poems from the Tower Bridge. Students have enjoyed this workshop and are now able to use poetry techniques in their English lesson. The students braved it through the snow to compete in the UKMT team competition. All had fun, but unfortunately the event had to be cut short due to the inclement weather; the students did themselves and PLS proud! Any visitors arriving at PLS on 1 December would have been surprised to see some familiar literary faces entering through the gates. Along with a collection of frail old ladies in wedding dresses that had certainly seen better days, came chimney sweeps, scullery maids, artful young pickpockets and some very pale looking old gentlemen, weighed down with heavy chains and cash boxes. All of this was in honour of our very first Dickens Day. The works of Charles Dickens feature prominently in the new English curriculum, including his classic novels and less known non-fiction essays. During Module 2 Year 7 have been studying “A Christmas Carol” and this celebratory day was a great opportunity to bring the text to life and learn more about writing Victorian style. Year 7 students were invited to dress up as Dickens’ characters and really rose to the challenge. All of the participants looked amazing, but the overall winners were Austeja Bartkute and Bradley Stoddart both of whom came as one of Scrooge’s ghostly visitors. The English department had great fun representing the characters in “A Christmas Carol”, including Miss Nelson, a vision in blue as Scrooge’s first love Belle, Miss Kazim as the morbidly pale Marley and Miss Hadley-Stone taking on the rather alarming persona of “death” - the spirit of Christmas Yet To Come. Thanks to all of the staff who sportingly dressed up; the winning outfit went to Miss Lynch as the jilted and jaded Miss Havisham. All English lessons on the day had a Dickensian theme, with some students having the opportunity to write in the style of Dickens with feather quills and ink. Messy but fun! Competitions running on the day included: ghost story writing, Victorian Christmas card designs and a scavenger hunt. Thanks to all who entered, there were some truly scary ghosts and very imaginative designs. Congratulations go to the winners, Radi Dimcheva in Year 9 for her story, and Emily Yau in Year 7 and Aryan Verma in Year 8, for their Dickensian Christmas cards. All entrants received certificates and their work will be displayed in the English corridor next term. From the vicious criminal Bill Sykes to blue-lipped, penny-pinching Scrooge, Dickens is probably best known for his larger-than-life and often socially outcast characters. To celebrate these multi-dimensional creations, Miss Shaw ran a Dickens reading workshop in the library at lunch time. Thanks to Mr Denny, Miss Lynch, Mr Mclean and Ranya Herhar in Year 7 for taking part and bringing these unforgettable figures to life. In the 19th century city fairs were very popular and Mr Dickens was a frequent visitor at these social gatherings. With a little tinsel, mounds of candy canes and some delicious home baked cakes we attempted to recreate a Victorian fair in the English corridor. Huge thanks to London Cake Show of Stoke Newington for making the incredible Dickens Day cake. This was a very popular part of the day, and £100 pounds was raised for Crisis at Christmas, a charity that the great man himself, a compassionate advocate for social justice, would surely have approved of. Dickens Day certainly was “the best of times”, made memorable and special by the enthusiasm and support of the school’s staff and pupils. BBC School Reporters were visited by Huw Edwards and the BBC School Reporters crew. PLC BBC School Reporters were given a workshop on how to gather news, they were also given the opportunity to put questions to Huw Edwards; it was an amazing experience for our BBC School Reporters. Huw Edwards was very impressed with our students and would like to come back to PLS. As part of the GCSE Geography course, Year 11 Geography students completed two fieldwork days at contrasting locations. The first location was Reculver, on the North Kent coastline and the second location was Greenwich town centre, South East London. On a very cold and windy Wednesday 8 and Thursday 9 November, Year 11 Geography students visited Reculver to investigate the coastal management schemes used there. Both days involved students gathering data, completing beach profiles and throwing oranges into the sea and measuring how far they floated up or down the coast (Longshore Drift test). Fieldtrip two was a little closer to home with a visit to Greenwich on Tuesday 14 November to look at urban land use and its impacts. The students completed a land use survey, pedestrian and traffic count, as well as looking at the various tourist attractions around the centre of Greenwich. Although the day was not as cold as Reculver, the students did cover a lot of steps whilst completing these geographical skills. This workshop was organised by EDF energy for Year 8 and 9 girls only. Girls only because, currently only 1 in 5 people working in core STEM (Science, Technology, Engineering and Mathematics) in the UK are women. Pretty Curious is a programme which aims to address this under-representation of women in STEM careers, both now and in the future. 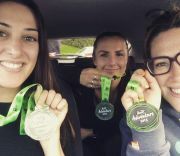 They want to help change the perception of STEM subjects amongst teenage girls, confronting the reasons why they are being put off from further STEM-related studies and careers. Our girls were tasked with creating their own inventions using little Bits kits (an introduction to circuits). They also worked hard to build their own robot following instructions given in an app using a mobile phone; the girls named the robot ‘future guide to the disabled”. They also had the chance to see how the activities relate to the real world by watching a 360 VR film featuring three aspirational women in STEM careers. On Friday 13 October, KS3 EAL Induction Programme Students visited Sea Life and London Eye. The trip was educational and fun. In Sea Life students learned a lot about the coral reefs and different types of fish. Afterwards, they were able to see all the important London landmarks from The London Eye and take photos of the amazing view. A group of Y10 students have been given the opportunity to take part in the Envision Programme. The Envision Programme is an interschool competition where students run a fundraiser to raise awareness and funds for an allocated charity. As part of the , the students receive mentorship from a company to help them achieve their plans. On the 2 October students from Prendergast Ladywell School visited their mentors at White & Case Solicitors; It was an exciting afternoon where the PLS Envision group were able to hold their planning meeting. This provided a unique opportunity to see into the firm’s prestigious office and give our students an insight into the various roles and opportunities available in the sector as well as design an excellent plan to boost their charity 'Food Cycle'. We wish them every success in their endeavour and we are sure we will continue to see great things come from this group. On Tuesday 19 September Alanouwaly, a Catford based African Music and Dance Charity, came into PLS to deliver a series of African drumming workshops to three of our Year 7 music groups. The workshops focussed on the techniques of African polyrhythmic drumming and playing drums such as the djembe and also African singing. Students were taught a traditional African song and played whilst singing and some students had the opportunity to explore the principles of improvisation and to take their own improvised solo. During period 3, the drum tutors selected the 30 students from the three classes who had impressed them most, they were selected to take part in a performance to a large audience during period 4; the students dressed in traditional African dress for the performance. A good time was had by the students, the tutors and the audience. Alanouwaly run events for young people throughout the year in Catford as well as events for the whole family, please check their website if you are interested in being involved. On Monday 18 September a group of our Year 11 students had the pleasure of been invited to the London Palladium to experience the world famous Bolshoi Ballet, they are an internationally renowned classical ballet company, based at the Bolshoi Theatre in Moscow, Russian Federation. We saw them perform a selection of famous Ballet performances on the theme of Romance; the music and dance was of the very highest standard. Our students thoroughly enjoyed the experience and it is an event we hope to continue to take part in in the future. The school had a really good feel, the students were great and very interesting. After meeting with a group of students and questioning me, their feedback about PLS was the teachers are great, they help and support if we are struggling, they care and we all have someone to go to”. We thank Vicky for her visit and hope to host her again soon! 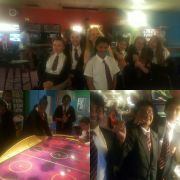 On Monday 10 July 2017, a group of Year 7 students enjoyed a bowling trip to Lewisham as a reward for 100% attendance, punctuality and excellent attitude to learning. 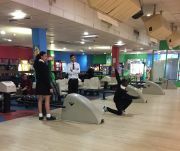 Ms Fionda, Year 7 Leader, led a team of staff and students on a fun filled excursion to highlight the students achievements and hard work as members of the Prendergast Ladywell School community. Creative Technology Faculty showcased students' work across Art and Design Technology. Y10 students visited Westminster Kingsway College to develop STEM awareness for students and to identify potential projects to be implemented in School. On 5 July Ms Russell De Boer from Prendergast School brought some of the Year 12 Product Design class to Ladywell for a taster lesson with Year 10 students. The students designed a postcard holder, testing their designs and also developing advanced rendering skills with markers. All students enjoyed the activities with several showing interest of continuing their design studies further within the Federation. Prendergast Ladywell School hosted our annual reading awards on Thursday 29 June. Our in-house reading scheme, “Rocket Readers” celebrates the reading achievements of Years 7 and 8. This year 50 students received trophies for having read between 10 and 50 books. Highest achieving readers also won a place on the Rocket Readers’ trip to Ripley’s Believe It or Not. After photos on the red carpet, students were treated to a buffet and entertained by our PLS choir singing summer themed songs. The awards were presented by teachers and guest speakers. These included, Leo Hunt, author of 13 Days of Midnight, Taran Matharu whose debut novel “The Novice” was a New York Times bestseller and Sarah Mussi who is not only a successful novelist, but also a teacher here at Prendergast Ladywell. Students spoke about their love of reading and their favourite books and authors. It was a brilliant evening celebrating the fact that in our technology-bound, social media-driven society there is still room for young people to escape into other dimensions through the written word. On Thursday 8 June PLS attended the Lord Mayor’s Presentation of Music. Our choir gave a fantastic performance, assisted by Mr Clyde and Mr McLean. It was really good to see the different styles of music, Prendergast Vale School had a huge gospel choir and Prendergast School had very talented musicians playing a more classical style of music, there were also really good singer/songwriters. It was a really good event and showcased talent across the Federation. Y9 students whom have chosen GCSE Sociology were invited to Goldsmiths University to attend a 'Time Bridge' event by the Sociology Department. The students were immersed in the social history of Lewisham, looking at the events that occurred in 1977 with the 'Battle of Lewisham' and the 1981 'New Cross Massacre', and the subsequent social impact these events had in shaping the community in which we now live. Students were given a talk by Professor Les Back, the Head of the Sociology Faculty on the events and social climate of the time, followed by workshops led by current undergraduate students. Professor Back then led he students on a tour of the historically significant locations, such as 439 New Cross Road (where the fire was set) and Achillies Street, where the local community clashed with and prevented the National Front from marching in 1977. The day finished with questions to a panel made up of family members of the victims, and social activists at the time who organised the march to Downing Street. The students had a great time, and acquitted themselves brilliantly - the University staff were impressed with their social awareness and their interest to learn about contemporary issues. We have been asked to be involved in more activities with Sociology at Goldsmiths because of their brilliance - Well Done! Prendergast Ladywell School were proud to host the Jack Petchey SpeakOut Regional final on Thursday 11 May, this was to be our second time hosting the event in eight years. This competition brings together students from across the Lewisham Borough to compete in a public speaking event. All competitors spoke eloquently and with passion, engaging the audience and the judges on topics that matter to young people today. The two students representing the school, Mmeso Emmanuel- Ekwegbalu and Deborah Ansa spoke from their hearts about things that mattered to them. 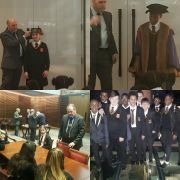 The event was well attended by parents, guardians, teachers and friends of the students competing along with the Mayor of Lewisham and other distinguished guests which made for an electric atmosphere and lots of support for our young speakers. Two of our performers, Dena Wilson and Lucia Fofane, sang beautifully and really entertained the audience. On Tuesday 25 April, 10 students from Prendergast Ladywell School participated in the Lewisham Book Awards 2017. 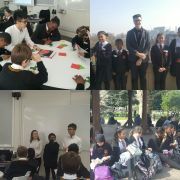 It was an exciting opportunity for our students to meet and work with other secondary school students in the Borough, who read the same books in preparation for the event. Students were placed in mixed-school teams of 6 and prepared presentations to pitch to a team of “dragons”. The “Dragons Den” style competition was interesting and varied, with students demonstrating their best persuasive sales pitch to convince the dragons to invest in their book. They were put through their paces as the “dragons” drilled them on age rating, special discounts, what makes their book unique and why they should invest in them. Team B featured our very own Rozolia and Aleesha, year 7 and 8 …… who were very worthy second runners up. The books featured in this year’s Lewisham Book Awards were, How to Fly with Broken Wings, A Seven Letter Word, Burning Midnight, George and The Door that Led to where. Three actors from Ginificent Productions visited PLS to perform an adaptation of the Novel Dr Jekyll and Mr Hyde by Robert Louis Stevenson to Year 11 students to assist with their GCSE preparation. It was a good performance and close to the original text providing an insight to the context in the post-performance Q&As. 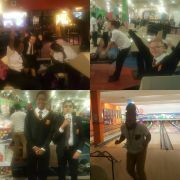 A number of students with most improved attendance had a fun afternoon on Thursday 30 March at Lewisham Bowling Alley. Mr Denny (Science Teacher/More Able Coordinator) organised an inspiring trip for the More Able Cohort of students in Year 7. Students attended the London School of Economics. Students got the opportunity to learn about the university, to have a question and answer session with undergraduates, they even experienced their own graduation ceremony. An aspiring and motivational day for students. On Monday 20 March, Year 8/9 students attended the regional final of UK Maths Team Challenge. PLS students did very well in the competition. 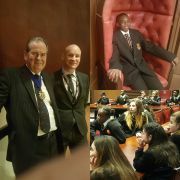 All Y7 students within the Federation were invited to visit the spectacular, newly completed Livery Hall (which stands exactly where the second Hall, the former Benedictine Priory of St. Helen, was located up until 1799) to learn about The Leathersellers, our Governors, who have been supporting education since the 17th Century. Author Katherine Woodfine visited Prendergast Ladywell School. She shared her inspiration for writing The Sinclair’s Mysteries, particularly her latest novel, The Painted Dragon. Katherine treated students to a masterclass on solving mysteries. Students were captivated with her amazing presentation and got involved to solve the mystery of the missing painting. Katherine’s prompts, codes and clues kept students on their toes until the mystery was solved. his time in the US, including questions about his reporting of the Obama years and the Trump presidency. Justin Webb made a big impression with the students who enjoyed the experience, many were considering a career in Journalism because it sounded so exciting and varied. We are confident that he brought new directions and impetus to many. “Niall it was a real pleasure and I thought the kids were brilliant – bright and funny and full of questions. Did you all a great credit. The Inspectors should note! Stay in touch” Justin Webb. On Thursday 2 March World Book Day came alive at Prendergast Ladywell School. Some members of staff came dressed as their favourite book character. The English Faculty depicted characters from Macbeth, a play they are currently studying. Students were entertained as they guessed which characters staff imitated. They were also delighted with the opportunity to vote for the best costume. The highlight of the day was the “Read Off”, an oral reading competition entered by both students and staff. Participants were given random reading material to read in their best reading voices. Judges awarded top marks for clarity, voice emphasis, accuracy and fluency. Rio-shanti, Year 8, was this year crowned Read Off winner. There were random “drop everything and read” moments throughout the day which promoted whole school reading for everyone present. Well done to Woody (Y8), Esat (Y9), Dante (Y10) and Mariama (Y11), who were the recipients of the Jack Petchey Achievement Award. On Friday 17 February Mr McManus, Head of PE, took a group of students from the Year 8/9 rugby team to Twickenham Stadium to watch the England Men’s team in an open training session. None of the students had been there before so were all very excited about the opportunity. They had photos with Mascots and statues before taking their seats and watching the England team in action. All of the students thoroughly enjoyed the day and we all learned a lot. Cathy Cassidy visited our school on 2 February 2017. She talked to Year 7 & 8 girls about her latest new book, Broken Heart Club and supplied them with inspiration for their own reading and writing. Cathy Cassidy is one of the UK's top selling children's authors and has twice won the prestigious “Queen of Teen” Award. These activities are designed to raise young people’s aspirations and increase their awareness of a range of educational and career opportunities in medicine and healthcare. The Roadshow gave students a chance to try their hands at being radiographers and physiotherapists. The Show gave the Year 8 and 9 students, who took part, an insight into studying healthcare subjects at university. PLS students in the information studio of the Science Museum.They learned how the invention of commercial radio brought information into homes for the first time and how, for many people at that time, their radio sets were homemade. The students had the chance to use the amazing collection of the Science Museum as inspiration to reconstruct a simplified vintage style radio set to hear a radio transmission. The session explored how the electromagnetic spectrum relates to broadcast technology, how radio waves carry information and how these are transformed into the sounds we hear. Y7/8/9/10 had an enjoyable visit to Bletchley Park Mansion. The aim is to raise profile of MAC students, link maths with History/real life examples. 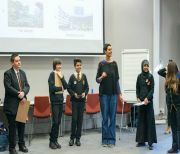 Young City Poets Project aims to use cultural stimuli to inspire students' writing by using poetry and cultural stimulus to help improve writing standards, and a free visit/student workshop at one of the partner institutions, as well as poetry resources for use in the KS2/KS3 classroom.